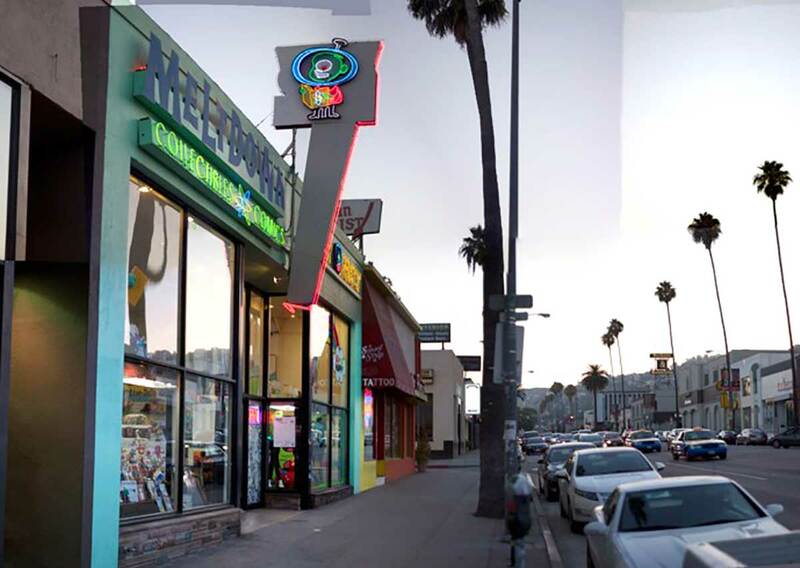 Comics on Sunset Boulevard in Hollywood -- is closing its doors after 25 years. It was always much more than a comic book store. It was a community center for creative nerds. It had a performance room and gallery, a podcast studio, and all kinds of fun pop-up stores-within-the-store. I interviewed many cartoonists there for live events over the years, including Dan Clowes and Ed Piskor, and our Dungeons and Dragons group played our game at a table on Sunday afternoons. I saw Ninja and Yolandi Visser of Die Antwoord play and talk about their videos to a packed crowd in the back room. I bought bitcoin from its Bitcoin ATM. And I bought lots of great comic books and art books. I'm going to miss the place and LA won't be the same without them. As is the case with all good things, at some point they must come to an end. Meltdown Comics is no exception to this rule and so, after 25 years coveting every comic treasure we could lay our hands on, I’m sharing that on March 30th I’ll be closing our doors for the final time. No business is easy, least of all one rooted in paper surrounded by brick and mortar, yet against all odds we survived just long enough to host, share, and celebrate some of the most creative and imaginative artists in the world. It has been my personal privilege to welcome so many incredibly talented minds through our doors giving them and their work a home in this great city of ours. And what a wonderfully surreal run it’s been… we’ve watched every fad, trend, and next big thing come and go while customers became celebrities, children blossomed to adults, geeks morphed into moguls, and fanboys scored Oscars. Throughout it all, I’ve been most fortunate to be surrounded by my family and the best staff anyone could have ever wished for – through thick and thin you supported Meltdown and invested in me, I will never be able to repay you but know that I am eternally grateful and forever in your debt. As I prepare to extinguish Sunset’s neon know that there is a new path for me (more later) and I close Meltdown without any regret. For 25 years I have been enriched by every inquisitive mind I have encountered on this journey and for that I humbly thank you, all of you. In signing off, I urge you all to continue creating comics, buying comics, and supporting the comic book world that has given us all so much over the years. For one last time, #LetsgoMELTDOWN! Congress passes FOSTA, Craigslist personals vanish. 'Casual encounters' & 'missed connections' gone.